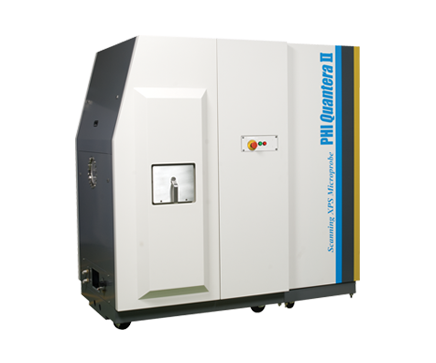 The core technology of the Quantera II is PHI’s patented, monochromatic, micro-focused, scanning x-ray source which provides excellent large area and superior micro-area spectroscopy performance. Spectroscopy, depth profiling, and imaging can all be performed over the full range of x-ray beam sizes including the minimum x-ray beam size of less than 7.5 µm. In addition to superior XPS performance characteristics the Quantera II provides two in situ sample parking stations which enables the automated analysis of all three sample platens in a single user defined analysis queue. Optical image of patterned metallization structure showing the SXI imaged area. Spectra from selected areas obtained using a 20 µm diameter x-ray beam show Cu on the surface of the metal pads and SiO2 off of the pads. 10 keV C60 depth profile of a 50/50 rapamycin and PLGA film showing segregation of the rapamycin to the surface of the coating. Whether you are a casual user or an expert, the work flow driven UI and enhanced feature set will increase your productivity. Chemical depth profile of a multi-layer Ni-Cr thin film structure showing the presence of Cr metal and Cr oxide layers. PHI MultiPak is the most comprehensive data reduction and interpretation software package available for electron spectroscopy. The tasks of spectral peak identification, extracting chemical state information, quantification, and detection limit enhancement are addressed with an array of powerful and easy-to-use software tools for spectra, line scans, images and depth profiles. Microsoft Windows XP and Windows 7 compatible, MultiPak can be used on the instrument PC to process data in real time or on an off line PC for report generation.